Everything you see here is paint on wood. In the last few years Alastair Gordon has adopted a form of trompe l’oeil painting known as ‘Quodlibet’. Originally a musical term meaning ‘what you will’, it was borrowed by some 19th-century artists who rendered it as ‘as it falls’: a group of items from daily life were painted as if discovered in the rough and tumble of daily life, lying on a wooden surface (sometimes painted directly onto wooden panels in aristocratic houses). Gordon’s assemblages consist of images – sometimes a collection of postcards recently received – that look like they have been posted up on a studio notice board using masking tape. But works of art, we know, are not that haphazard. There is something very deliberate in the casualness. The artist invites us to meditate not only on the images that he reproduces, but also on the unusual method of reproduction. These images are clearly paintings, not photographs. This is a painting of a painting; and, for all we know, it may be a painting of a painting of a painting. Reproducing another artist’s work is a regular trope of conceptual art to undermine our confidence in reality and in artistic authenticity. But it need not lead down that road. The devotion to faithful reproduction speaks of love, of a celebration of creativity, of humility and purposefulness, which all stand against postmodern nihilism. Gordon explained that he painted Sacrament after hearing a lecture about how objects manifest and at times embody ideas that surpass the mere sum of their parts. Wedding rings point towards a meaning deeper than their metal value or even their metaphorical significance. Gordon saw a connection with how paintings embody more than the sum of their chemical and material components and become signs or symbols, pointing towards a deeper value. This is a painting of a painting, and yet – in a Christian worldview – it points to a profound reality that is really there, unchanging, reliable. 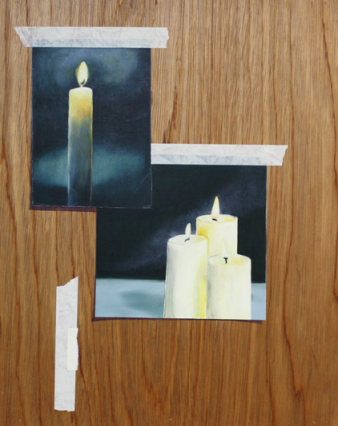 The painting points to another painting that points to a candle that points to the idea of light in the darkness that points to Jesus. And Jesus reveals to us in visible, tangible, human form the reality of God himself. For the viewer the painting in turn becomes an opportunity to stop and reflect. It is an intriguing work: it does not preach, but it is richly suggestive. The single candle points towards Jesus, the Light who ‘was coming into the world.’ The three candles may well remind us that God is Trinity – that wonderful, unique truth that God is one as a community of three loving persons. But the one candle may also remind us of the appalling cost of God’s love that came to redeem us from our rebellion: that there was a separation in the Godhead, when the Father finally turned his face away from the Son, when the Son entered our darkness and ‘became sin for us’ (2 Corinthians 5:21). And what about the missing picture? That other piece of tape invites us in. It is vertical rather than horizontal and seems therefore to point to a different kind of image. Does it invite us to contribute a picture of our own? To include our response to the Son, who humbled himself for our sakes? The Advent candle – even in reproduction – warms us with the reality of hope in our wonderful God. Alastair Gordon: Sacrament, 2013, oil on wood, 50 x 40 cm, private collection. Alastair Gordon (b.1978) is artist-in-residence and Gallery Manager for Husk, a café and creative space in Limehouse in East London, that has a heart for community, comtemporary art and excellent coffee. This year he began as course leader for Critical and Professional Studies, a part time postgraduate course at Leith School of Art in Edinburgh. He is co-founder and director of MorpheÌ„ Arts, a mentoring charity for graduate artists. He was awarded first prize in the most recent Shoosmiths Art Prize and has been selected for several other awards including the Threadneedle Prize and at Oriel Davies Gallery, Beep 2014 and The Open West 2014. He was commissioned to mark the 180th anniversary of the London City Mission. The resultant work The feet of those was a collection of small canvases each reproducing a pair of shoes, to represent both the loving labour and the diversity of LCM’s workers. It was exhibited at the Nunnery Gallery, Bow, London (September–October, 2014). His paintings are represented by the Londongallery, Bearspace, where he recently held a solo exhibition. See www.alastairjohngordon.com. Nigel Halliday is a freelance teacher and writer in the history of art and one of the leaders of Hope Church, Greatham, in the UK. See www.nigelhalliday.org.